Age is the most well-established intrinsic factor for injury. The older a person is, the easier it is for that man or woman to get injured. 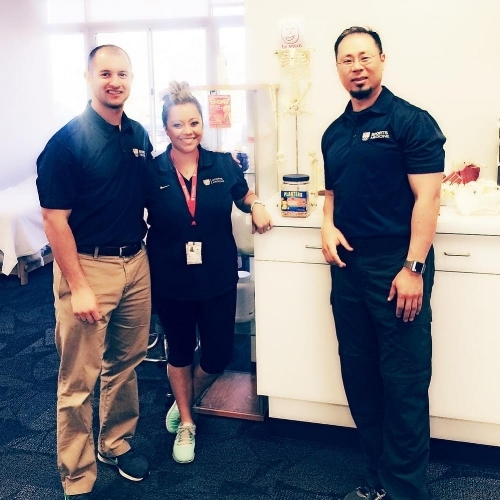 Dr. Mulford understands that sports injuries can prevent an athlete from reaching their full potential, therefore she emphasizes avoiding injuries through chiropractic adjustments, soft tissue treatment, nutritional supplementation and rehabilitation. Most sports involve extreme body contact, fast starts and stops, and positioning that places unusual and extensive amounts of strain on the body. Dr. Mulford understands that athletes, especially those who focus on endurance, put their bodies through intense strain, and thus cope with unique physical challenges. It is common for those that run extensively to experience knee pain, tendonitis, neck, and back pain which is often due to a loss of flexibility in the spine. If these symptoms are not treated, this irritation can contribute to joint pain and other dysfunctions throughout the body. By restoring the athlete’s spinal mobility, Dr. Mulford can help an athlete improve his or her joint flexibility, increase endurance and decrease pain in longstanding injuries while preventing future injuries. How can Chiropractic help with sports? Why should an athlete be adjusted? By being adjusted on a regular basis it allows the full range of joint motion, the ability to work underused muscles, and reduce stress from overused tissues. An athlete who can move fully, with balance and control can perform his/her best. Chiropractic Physicians pay special attention to the spine, joints, muscles, tendons, ligaments, and nerves allowing the player to maximize his/her peak performance, minimize injury risk, and allow for fast recuperation. Many world class and Olympic athletes, as well as professional athletic stars and teams, have retained sports chiropractors to provide care. The specific taping methods alleviate pain and facilitates lymphatic drainage by microscopically lifting the skin. The taped portion forms convolutions in the skin, thus increasing interstitial space. The result is that pressure and irritation are taken off the neural and sensory receptors, alleviating pain. Pressure is gradually taken off the lymphatic system, allowing it to channel more freely.